Technology that mimics the functions and sensations of human skin may sound futuristic, but it isn’t exactly new. In 2010, scientists at Stanford University and at University of California, Berkeley, developed artificial skin that could feel even a gentle touch. Dubbed e-skin, the device holds great potential to help future robots more delicately interact with humans. But now, researchers at the University of Colorado Boulder are giving e-skin an environmentally friendly upgrade. As Adam Epstein writes for Quartz, the latest iteration of the device can re-heal itself and be recycled to make new layers of skin. 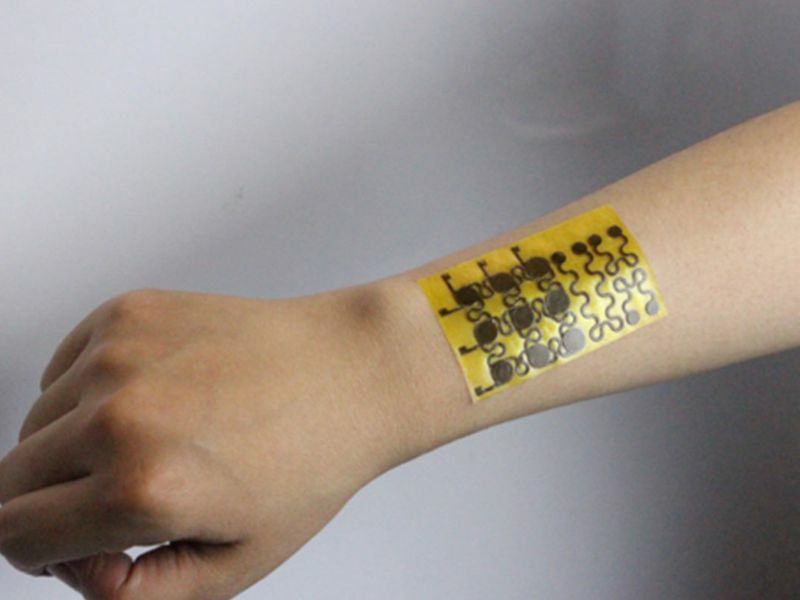 The recyclable e-skin, which was described last week in the journal Science Advances, looks like a thin, yellow adhesive sticker. Embedded in this thin layer are sensors that measure pressure, temperature, humidity and air flow. It’s made out of a polymer and silver nanoparticles, which allows it to bend and move with curved spaces like fingers or toes. It’s also soft, but not quite as stretchy as human skin, The Verge’s Alessandra Potenza reports. Many labs around the world are creating e-skin. But what makes this e-skin special, Potenza points out, is that it’s virtually waste-free. It heals itself through a chemical reaction between the compounds that make up the bandage-like film. If it is sliced, the researchers can simply just add more of the original three active compounds that make up the film and the ensuing chemical reaction will knit the e-skin back together, “healing” the wound, Potenza reports. If ever damaged beyond repair, it can also be soaked in a solution that separates out the silver nanoparticles and then be recycled into new e-skin. The healing process happens fast, too. It only takes a few minutes at 140 degrees Fahrenheit or 30 min at room temperature, while the recycling process takes about 30 minutes at 140 degrees or 10 hours at room temperature. As Jianliang Xiao, mechanical engineer and lead researcher on the new study, tells The Verge, these new properties make the device more environmentally friendly, one of their primary goals. Among the most practical application for this e-skin is robotics. As Xiao tells Newsweek, e-skin could improve how robots interact with humans. “When the baby is sick, the robot can just use a finger to touch the surface…it can tell what the temperature of the baby is,” Xiao said. Similarly for prosthetics, the e-skin coating could help the user sense the temperature of an object or surface and figure out how much pressure to use when picking up an object, Epstein writes. But researchers also believe the environmentally friendly aspect of the e-skin could have incredible possibilities. Xiao tells Newsweek he could see a future where you can reuse materials from old electronics by just soaking a cell phone or laptop in a solution to recycle them.